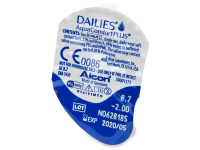 Dailies AquaComfort Plus daily disposable contact lenses are available in an economy pack of 90 lenses. They have an exceptionally high water content, which provides all-day comfort. 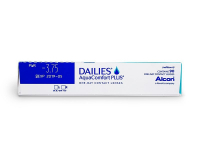 Dailies AquaComfort Plus are daily disposable contact lenses produced by Alcon. Compared to their predecessor, Focus Dailies All Day Comfort contacts, these lenses feature a higher level of moisture, which makes them more comfortable to wear, and simultaneously ensures sharp, clear vision. This package contains 90 lenses. Solution with HPMC lubricant One of the moisturising components, known as HPMC, is present in the solution that surrounds the lens in its blister pack. Because of this, the lenses should be sufficiently moisturised and comfortable from the very first application. The other moisturisers, known as hydrophilic PEG (Polyethylene glycol) and PVA (Polyvinyl alcohol), are embedded in the lens material. The PVA is released from the lens all day with each blink.Important for you to know: when switching from Focus Dailies All Day Comfort to Dailies AquaComfort Plus there is no need for a new prescription. Lenses that I can wear all day. Really comfortable and convenient. Pretty good daily lenses, no complaints so far. Used these for several months now. 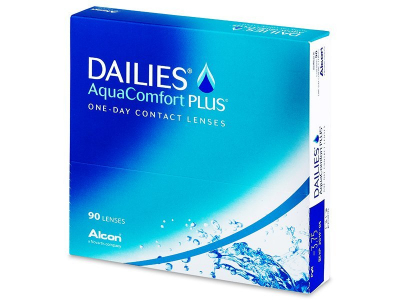 Lenses that stay comfortable for the whole day. I’ve been wearing lenses for many years and these are probably the most comfortable. Never been let down when using Dailies. Good price and delivery too. Convenient daily lenses. Used monthly lenses for a while but these are a really good alternative since I don’t have to worry about them. Just take them out at the end of the day. Really comfortable lenses. Fast delivery after ordering online.